The Oconee County Board of Commissioners is scheduled tomorrow night to approve a Transportation Improvement and Maintenance Plan for fiscal years 2011 and 2012 that includes an additional $205,000 for the widening and upgrade of Daniells Bridge road. The widening ultimately is scheduled to run from the Daniells Bridge road intersection with the Oconee Connector to just east of the blind curve at Lynn drive. Work on construction in the intersection itself is expected to start in about three weeks, Emil Beshara, public works director for the county, told me in an email message of Jan. 28. Beshara said that QuikTrip, which is building a gas station and convenience store on the northeast side of the intersection, is supposed to start work on the roadway at the site in five to six weeks. The county has to have the road work done on the opposite side to handle the resultant traffic, he explained. 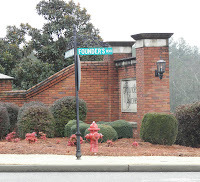 Standardization of Daniells Bridge road to three lane with turn lanes from the Oconee Connector intersection to Founders boulevard will be completed this summer, Beshara said in his email message. Beshara said he planned to wait to do work on the roadway beyond Founders boulevard "until such time as the Lance-Anglin property development begins. I say this because there will be no need for widening DBR (Daniells Bridge road) on that leg until that property develops." In November of 2008, when the Board of Commissioners first considered a rezone of the 9-acre tract owned by Dolores N. Lance and Dorothy N. Anglin just east of the blind curve on Daniells Bridge road, the commissioners asked Beshara to come up with a plan for improvements in the road to the development site. The BOC voted to approve that rezone from agricultural and residential use to Office Business Park in December after Beshara presented preliminary plans for the widening of the road to three lanes with a center turn lane. Beshara said at that time that the work would be finished during the summer of 2009, but no work was ever done. Beshara also told me in July of 2009 that work on the intersection would begin in late summer or early fall, and again nothing happened. The BOC had approved $400,000 from Special Purpose Local Option Sales Tax revenues for the Daniells Bridge road improvements as part of an earlier TIM Plan, and Beshara said at the rezone hearings that $400,000 would cover the costs. Beshara told the BOC at the agenda-setting meeting on Jan. 26 that he needed an additional $205,000 in SPLOST funds because of new cost estimates for the roadway. No one from the board asked any questions about the additional expenditures or for a timetable of the work. The commissioners put the proposal on the consent agenda for tomorrow night, meaning it will be voted on without discussion unless a member of the commission objects. The Transportation Improvement and Maintenance Plan calls for $12,845,000 in spending in fiscal years 2011 and 2012, with $3,380,000 of that coming from SPLOST. In addition to the Daniells Bridge road widening, SPLOST funds will cover 36 miles of county road repair and resurfacing and maintenance and improvements of county bridges, including the Clotfelter road bridge over Barber Creek and the Old State Route 15 bridge over McNutt Creek. The TIM Plan also includes $9,465,000 for what are labeled as major transportation upgrades and improvements. Included are design and right-of-way acquisition for the first phase of Mars Hill road widening from SR 316 to Hog Mountain road, design and sidewalk work for the Oconee Connector extension now under construction, and design, right-of-way acquisition and construction of sidewalks in Butler’s Crossing. The TIM plan lists $5,518,400 of that as reimbursable from the state.